It's unfortunate in some areas that tap water can't be made to taste better. Where I live the water has so many chemicals in it, it almost makes you thirstier. I decided to install the reverse osmosis system for both environment and health reasons. I was buying gallon jugs of water for the longest time. Half of them tasted like plastic which probably was leaching harmful chemicals into the water. Also I was sick of wasting gas and time driving to the store when you can get water out of your tap. Plus I have heard it takes 2 gallons of water to make a plastic jug. What a waste of water! Because of the initial cost and price of the replacement filters, it seamed like it would be hard to get any return on the investment but now after using it for 6 months it's hard to believe we lived with out it. I purchased the unit for $155 on sale at Lowes. To make the current faucet work I had to order extra parts from kohler to change my faucet from a three hole into a single hole unit. Lowes also sells different finishes of drinking water faucets that work with this system so you don't have to live with the chrome faucet. It doesn't have a battery filter change reminder but you can sign up for email filter change notification to change your water filter every 6 months. Two of the filters ($45 for the two filters) need to be changed every 6 months while the reverse osmosis filter ($59) should be changed once a year. The biggest complain I have heard about these reverse osmosis systems is that it appears that a lot of waste water goes down the drain. When I initially installed the reverse osmosis system I ran the waste water drain directly into the sink drain. All night I could hear the water running and gurgling in the sink while it filled the tank. The next day I ran the waste drain into the basement so I wouldn't have to listen to it drip all night. For about a week the water ran and ran. I ended up calling whirpool about the excessive water consumption and they had me take the system apart to look at the gaskets. It turns out my gaskets were not working properly so they sent me another whole unit. Once the new unit was installed everything worked great. I would bet there is about 3-5 gallons of waste water everyday but I believe as with any reverse osmosis filtered water there is a similar amount of waste water. I'm thinking about eventually running the waste water to a rain barrel outside. Since the water draining was noisy I would recommend running the waste water into a drain in the basement if possible, it may have just been my old plumbing but I didn't like hearing the water trickle down the drain. After using this system for the past 6 months I am extremely happy with it. The water tastes better than most bottled water and I never have to carry those water jugs again. I wish the filters were cheaper but the convenience of water from the tap is wonderful. Also I feel that even though there is waste water I'm probably wasting less natural resources than I was before. Also I drink much more water than I ever did before. Now I'm wondering if you can recycle the filter cartridges? You can find the WHERE25 instruction manual here. It includes how to sanitize and purging the filtration system. It also includes updated information on sanitization cartridges that are available. Hi, Where can I get a filter for my Whirlpool Model WHER25 RO system? I had it installed last February and it is calling for a filter change but I can't find one, not even in Lowes where I purchased it. Love the machine. Had one up in New York and it's the first thing I installed here in Florida. You can also go to ecodyne.org/rof and that will take you to the Whirlpool site for this RO system. You should be able to find a filter there. We bought our Whirlpool WHER25 system one year ago. While I agree, the taste of our water is vastly improved, I must say that the ongoing dripping of the waste water. Unfortunately, we are not able to run the line down to the basement and as a result I am constantly hearing the dripping water. Had I been aware of this ongoing problem prior to buying and installing this system I would not have purchased it. Diaphragm Kit #7250876 and Plunger & Spacer Ring Kit? I appreciate your help. I want to stock "one ahead" replacements for my RO 25 system. I cannot find date codes on the stock that Lowe's has. Any idea of the 'shelf life' of these membranes? Thanks. I have the WHER25 RO system. I have had it about 2 years. This time when I changed both filter the water flowed very slow, so I also change the Membrane. It still runs very slow. Any Ideas as to what I can do. Make sure you have the little plastic flow control inserted into the drain tube. Also make sure your membrane isn't deformed I have one that looked normal but never sealed correctly. Best of Luck. I have one of the RO units from Lowe's. It does what it is supposed to do, but if you let the water run all the time the filter is working all the time, night and day, and won't last long. I have a lot of dissolved solids so that my membrane is only good for a month . I installed a shut-off valve. Jim G.
If the water runs all the time it could be possible the membrane inside the unit may be defective or your incoming water pressure may be to low for this unit. I like your solution to the problem though. If I get a glass of water the unit will drain the gray water for around 2-5 minutes. I have a wher25 filter system. It has started leaking severly out the side breather hole. I changed the filters, no luck! I checked the drain, it's not pluged! I need an exploded view as to how this is put togeather. I am an engineer but without guide lines I might damage the unit. Is there a gasket kit? Help!! I just installed the WHER25 system and am extremely disappointed with the incredible waste of water it produces. It has been running for 36 hours straight, including the initial setup purge and sanitize cycles. Even though the tank felt full last night, this morning it was still running and dumping gallons and gallons down the drain. I am not going to bother calling Whirlpool, because even if it isn't working properly now, which I suspect is the case, I can not accept a system that runs for several minutes after pouring a glass of water as someone mentioned above. We use 2 gallons of filtered water per day! I know that just from this short experiment with the WHER25 we are going to see our water bill affected. Back to Lowes it goes. There isn't an "incredible waste of water" or "gallons and gallons" of wasted water. RO systems need water to flush the wastes it filters out down the drain where it will be dealt with in the spring services. The water uses are minimal during system operation and you should not experience any excessive water bill charges or even notice any additional usage on your bill. You should have done your homework before the purchase to ensure that the operation of this unit wouldn't have upset your unfounded overly sensitive considerations for your unfounded and unsubstantiated opinions about the quality of drinking water produced by this fine unit. We have used this unit in a rural environment for one year and it not only produces exceptional levels of quality drinking water there isn't a noticeable increase in the levels of water usage over the last twelve months. We were aware of the operation of this system and we're willing to accept the level of water usage to gain high quality drinking water from a water supply that is fair at best - filled with dirt, sand and gravel on a regular basis due to rural repairs in similar quality soils in our area. City dwelling people should experience extremely high quality drinking water from this system - and rural consumers will finally have a reliable source of high quality drinking water regardless of a minor amount of water usage used to flush the filtered sediment away and down the drain. Somehow goofed my post. To continue: I wonder if the public would benefit having, say a mobile RO/drinking water service deliver into your bulk storage system? Convenience... and probably cheaper than in-home RO. Probably being done somewhere. I have this model. The flow will be strong for about 3 cups and then slow the about one half of a pencil size. Very annoying when you are trying to get a 12 cup coffee maker to fill. I changed the filters hoping that would cure the problem. I didn't. I then purged the tank thinking it was water-logged. No improvement. What is my problem? The pressure on your water storage tank may be wrong. You should be able to use a tire pressure gauge to check it. Call the manufacturer to find out what the tank should be at. Best of luck. I have this unit as do a few friends and relatives, or similar units. The gurgling is normal, and in most or all places it is code to run the drain up to the faucet, creating an air gap, then to the black tube to the drain to ensure a backup doesn't get in your drinking water, making it even louder. 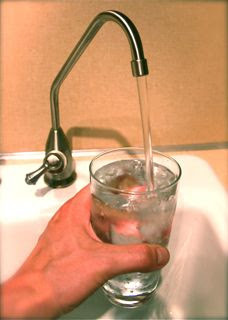 Many ebay or DIY installs don't use the 3 plug method, but a single pure water line to the faucet, and with no problems. How do you measure the TDS (Total Dissolved Solids)? Do you have to use/buy a conductivity meter or are there small cheap kits that can be purchased say at a fish store? When changing the pre and post filters, is it really necessary to 'purge' the system for 24hrs? I could understand running a couple gallons through, but 24hrs seems like a waste. Hi, I have a Lowe's Whirlpool Model WHER25 reverse osmosis system. The system is roughly a year old and it is leaking around the dispenser faucet at the sink. Where can I get a replacement? I have a WHER25 which works well but is noisy. There is a noise coming out of the air gap at the faucet. And the constant dripping while it is refilling. How do I get rid of the air gap noise? The only way to get rid of the noise is to run the line to a basement drain that you won't hear dripping. It is a very annoying sound. Leaks from the airgap hole is probably because the black drain tube is connected BELOW the garbage disposal connection. The disposal is shooting gook into the WHER25 drain port and it plugs up fast. Solution is to move the drain port above the T connection to disposal if there is enough room. Otherwise, disconnect the drain port and clean out. My drain tube runs constantly. I loose 1 gt of water an hour. Ive changed filters and everything but cant get it to quit. This doesnt seem right .Is It???????????? Any suggestions???? The diaphragm inside the unit may be worn, but call whirlpool or ecodyne first and ask them about it & they will probably send you out the parts for no charge. I just installed the RO system 2 weeks ago. Today, the yellow light started blinking. It blinks twice and then pauses and then repeats. Clearly I am not in need of a new filter yet... is there a problem with the system sensor or could it be something else? I didn't use the stock faucet so I'm not sure what might be wrong. I would defiantly call the manufacturer and get some help. Best of luck! Great question I was wondering this myself! I just called the manufacturer and was told by a sales person that there is a bladder inside the tank that he believed it is made of polybutylene. I asked if there was a risk of BPA and was told no. I did't ask about the rest of the unit such as the filter housing and tubing but considering the water mainly sits in that tank for long periods of time this would be the main area of concern. Any body know if there are concerns about the safety of polybutylene and drinking water? we bought the wher25 ro system 2 weeks ago and had a plumber professionally install it. I purged it for 24 hours and then got ready to get great tasting water. but alas, no water. called the help desk at least 10 times. they finally sent me a new unit, hooked it up, purged it for 24 hours, and the same result, no r.o. water. what good be wrong? Turn the faucet off for 2 hours to allow if to rebuild the pressure it lost during the 24 hour purging. When you purge it there should be water coming out of the faucet. If the tank isn't filling up you may have low water pressure or the tank could be over pressurize. You can check the tank pressure with a tire gauge but you'll have to call the manufacturer and ask what the pressure should be. Best of Luck! There is water trickling from the r o faucet during purge, but after the purge no water is going into the r o tank. we checked the water pressure and it is sufficient, and the pressure in the tank is 6 psi. the instructions recommend between 5 - 7 psi. Sorry I'm not sure what it could be. Try getting a hold of the manufacture's technical help and not a sales person. They will probably know right away. I bought a model # WHER=25 reverse osmosis from lowes about 5 months ago . My water bill went way up last month . I notice it runs like all the time and the amount of water it wastes is about 1000 to one . Is this the fault of the unit ? I did like the unit for the first 2 months but now I feel something is broke or faulty . Please tell me what to do !!!! Should I bring it back to Lowes ? I do see it is guarenteed for a year . call the manufacture. They will probably send the parts you need right away. This reverse osmosis shouldn't be running constantly. The water should only run for up to 10 minutes after you have used it. I have one of these units, but I want to run it without the tank. I make aquarium water with it straight in to water jugs, and the tank takes up space. Is there some way to run this without the tank? Thank you! I have the WHER25 filter system for about 5 years now.I just took the tank out and restore the pressure is working better then new the manufacture recommend 7lb of pressure, i did cheat a little be Got it to 10lb and is working supper. I have had my WHER25 RO systems for a year. I changed the filters out for the second time and when I did the water slowed down considerably. I have checked to see if the filters are tight and to make sure that they are installed correctly and they appear to be. What can I do to improve the flow of the water. I have been on the phone many times with Whirlpool lately because of low flow problems with my system. Your problem sounds like it might be a air bubble in the tank from not putting the filters back on in the correct order. Apparently, when you replace the filters, you are supposed to put them on in a specific order in so you don't get air in the tank???!! You are supposed to put on the post filter, the membrane, then the pre-filter, in that order. You might try taking the filters off and putting them back on in that order. Also, you might want to check the pressure in the tank. Should be about 6-7 lbs when it's empty. How did you pressure the tank up? Thanks. The electronic faucet reminder is not really necessary. You can sign up with filter company for them to send you an email when it's time to change the filters. I never used the faucet that came with the unit so it was never an issue for me. You might want to take the battery out and see if the email reminder works for you. What faucet are you using if you are not using the one that comes with the unit? I not certain but I believe it's this one. I paid my plumber twice to install and then troubleshoot the Whirlpoool WHER25 reverse osmosis drinking water system only to find out when I called the company (since we never got it working as it apparently got clogged up with the elements from New York City water in the first hours of use) that I would have to purchase and additionally install 1. a water softener and 2. a water pre-filter in order to have the iron, magnesium and calcium removed and the water properly treated prior to the water reaching the WHER25 system so it could do its work. There were no warnings about this where I bought it. And the men I spoke to on the phone at customer service in Minnesota passed me along from one to the next , " I got another one here from New York, her unit's plugged up and she wants us to take it back." I was also asked if I use "city water or well water". Apparently it might work with well water. love my wher25 but need parts cannot get mfg. phone no.? My WHER25 has worked like a dream for the past 5 years. Now when it's filtering water it leaks around the auto shut off. I saw a video on youtube on how to open it and look for defective diaphrams which I did but they appear to be fine. Both my pre and post filters are only 1 month old but I've not replaced the membrane yet. When I took it off, the water I poured out of it looked okay. Any suggestions? I'd definitely contact technical support to get help from the manufacturer. I have had the WHER25 for about 2 years. The tank of my WHER25 does not have water in it. How do we fix this problem? Does this mean the water is draining out? So confused about this. I need to order a replacement tap for my system, but they don't stock them at Lowe's. Replacement taps that I've found online have different connections than the stock tap that came with the system. If you know where I could find one, that would very appreciated. I tried calling the number you posted, but it is one digit short. This is the faucet I used. Your water tank may have lost pressure. Definitely call tech support 1-866-986-3223. What does it mean to "dispose of the filters in a proper manner"? I would think this just means in the trash though I wish you could reuse the containers and just refill them. My whirlpool reverse osmosis unit just stopped producing water. There is no water in the tank. Changed filters and charged the bladder in the tank about 45 days ago and it was working fine. I've had this problem. If you have very bad water(well) etc, the drain line might be plugged, and also check where the line comes in on the tap. This cleared my problem. my tap used to leak also. the line that your water drains from might be plugged up, you can remove is easily and clean it out, also check right on the tap, make sure there is no sediment buildup inside the nozzle where this lines attaches. I have to clean mine every once in a while because of my well water. this fixed the leaking tap problem. Finally got the Whirlpool R-O system working after a major kitchen renovation during which our G.C. 's plumber quit working on the unit and gave us our money back. He had set up 75% of the system, but was annoyed that the manifold where the filters fit kept leaking and was especially frustrated having to work with plastic tubes and not the copper to which he is accustomed. Since I was at work while this was all going on and my wife never liked the idea of the system anyway (we live in the Chicagoland area and Lake Michigan tap water is already pretty good), I told the plumber I would finish it on my own sometime. After many conversations with Jeff in Ecodyne customer service, and acquiring a few new parts to fix what the plumber did and hook up the system to our mixer/faucet, I pressurized the system and--the manifold leaked like a sinking ship. Thinking quikcly, I firmly grabbed the yellow and blue tubes and shoved them tightly into their collars. The leak stopped immediately. The plumber had never pushed them in tightly enough to lock. Granted, pulling on the plastic tubes ast a sharp angle will open up enough of a gap to cause a leak, but as long as nobody messes around under the sink, I think the system should remain leak-free. Yes it's noisy when refilling the tank and yes, the filters are expensive. But the water tastes cleaner and it gives us back the real estate we otherwise would have sacrificed if we'd bought a refrigerator with a dispenser on the outside door. I wish I'd been home with the plumber when he gave up so I could have jammed the plastic tubes into place and saved the day. Although I guess I saved myself a few hundred bucks in the end. I lived in downtown Chicago for awhile and a bath tub full of water was swimming pool blue and tasted like it too. Which tube do i hook up to to provide filtered water to my refrigerator? Re: Frequency of changing filters...DIYRog on 1/21/12 just touched on the sudject. I just finished my first 7 months with my new system (light came on at 7 months). Since according to the manual, the light is basically a timer, set to go off after 6 months, but indicates nothing about the quality of the water or filters, I was skeptical. It simply seemed to be a possible way for the manufacturer to make more money on selling filters. After going to Lowe's and paying $42 for two filters and a battery, I think I'll save them and enjoy the pretty flashing yellow light until the water starts tasting bad, pressure drops, or I learn some reason why I really should change them right now....Any thoughts, folks? Just remove the battery for about a minute and then put it back in and it will reset the timer. Or, just remove the battery and throw it away! Then replace the filters as needed. I'm thinking of trashing this whole RO unit. The filters are ridiculously expensive and Lowe's doesn't stock them anymore. I can get a better RO with cheaper but better filters at Plumbing Supply dot com. I'm convinced they sell this unit at or below cost to get you into the real profit center of buying the filters. A set of filters is only $20 less than the whole unit costs! I Agree, filters prices are to damn high! Thanks for the Web address. It was very helpful! I was wondering how often you all change the filters. I know it says every 6 months and the other 1 year. We are a home of 2+dog(yes dogs gets this water too!) and it has been 1 year now. I don't feel that the water tastes bad or leave calcium deposits. I will buy a filter but I feel sad to change it. Just curious how often you change your filters. It isn't cheap. have just changed the 3 filters for the first time, but now I have no water pressure coming from the fridge, how can I fix this? if you have the space in your home near the water heater, install a whole house filtration system. It's massive and the price is less than $350-$500 and you never have to change the filters ever. I live in a condo so there is no room but if I had room, I would change it fast. The clean water works for all of your faucets! The WHER 25 is a noisy leaky piece of crap. It's the Hyundai of reverse osmosis. That gurgling water sound is like water torture. we don't get gurgling water sounds with the WHER 25. 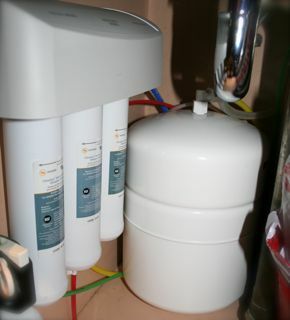 I have had several Reverse Osmosis systems including the WHER 25.... The WHER 25 is the most space efficient and user friendly of all the available systems. However it is no longer my first choice because of the manifold that makes it easy to use. Other systems are less money to change filters and membrane yearly and they also make it way easier to install booster pumps if your water is low pressure and a permeate pump if you want more outlet pressure. The permeate pump is very nice for not using as much waste water and having much higher pressure at your outlet. you have to install it in hoses that the WHER 25 doesn't have. So get a cheaper system and have fun. We have had the RO system for about 2 years now and just made our 2nd filter change ( 3 if you count the original) everything has been fine but just this week we noticed the tank isn't refilling. I checked all hoses are connected tight and everything is dry underneath current filters are about 2 or 3 months old. Any ideas ? c. Ran my G string (guitar) center wire only thru the Flow control insert hole. She is processing water at the original clip as I recall where before it was next to nothing and dripped out of the faucet. It seems this system is not as reliable as once thought. I am going to change the Flow control valve - after this something internally (plastic casing) or my water pressure is to low. This system is quickly heading out the door as it appears - alternatives! Mine died after 6 years of tough use. It started to have a really low flow. After reversing the pre an post filter I saw a bunch of rust coming out of the water. I call the tech support and they told be the bladder inside the tank broke. I tried to fit a new ispring ro filter system since the filters are cheaper but it wouldn't fit under my strangely plumbed sink. Looked like a nice system but may be messier when changing the filters. **Anyone having pressure issues I found a solution! the pressure pump is underneath the blue plastic on the side of the tank... remove the white cap and you can check the pressure. Mine was completely empty! I opened the RO water faucet and put a bike pump to it... at first I was pumping and it didn't seem to take anything (the fitting felt odd) however I kept pumping and as the pressure filled, more and more water came out of the faucet. It's supposed to be at 7 psi but mine ended up somewhere around 10 (hard to get it exact with a bike pump) and it seriously works amazing now!!! Even better than before I was ever having the problem. It's fast and amazing. I'm so happy to have this fixed and I wanted to help anyone who might be having the same problems. 1. Throw battery away, ignore filter change emails! 4. Install tee in yellow line (to tank) and run to fridge for ice and WTTD. 7. If water is pouring out side of faucet, check drain tube or connection. I have had this system for almost four years and recently it started making the gurgling sound coming from the faucet opening that other people talk about. This noise wasn't there before and it starts every time the tank has to refill. I have changed the filters and RO membrane and nothing. The drain line is NOT clogged. Could it be the diaphragms? Or how do I get rid of this annoying noise? I know when it drains it can be noisy. I myself have never heard any noises from the faucet opening unless it was after I was changing the filters and some air got in the line. It could be the tank liner broken. Call the techs at ecodyne. They will work you through step by step just make sure you are next to the system when you call. Check pressure on your tank, make sure it's around 5-7lbs, or what ever your manual tells you that the EMPTY tank pressure should be. seems to me there is something about the drain hose (black line) getting plugged. Don't bother with the battery. Change the filters when you notice a change in your water flow, invest in a TDS (total dissolved solids) tester to check your unfiltered/vs filtered water and when it goes above recommended limits, time to change your pre and post for certain. what''s your household water pressure? You can also try switching out pre and post filters to see if your pre-filter is getting blocked by sediment in your water, in which case you may want a household (like a rainfresh) filter on your incoming cold water line to catch guck. I myself use 3 prefilters because I'm on well water - a 30 micron, 5, and 1, plus UV. But likely if you're on city water, just one at 5 microns would be good. I had another person install this and I was wondering when you put the battery in does the light turn on and stay on?? The light should only come on when it's internal timer goes of. You might have to look up how to rest the timer. It may be as simple as pulling the battery out for awhile. Yes, it should only flash and then go out, and come back on after about six months. But the light is JUST a reminder, it has no way to know the quality of your water. If you have very good water you can get a year or more, perhaps even two out of the pre and post filters, more from the RO membrane filter. Judge your timing by how well the water flows from the small faucet. This unit is a Rip OFF!!!! just replaced the Diaphram 6 months ago and already there is a tear in it and leaking again!!! so another 45.00 to fix! DO NOT BUY THIS PRODUCT TOTAL RIP OFF + ALL THE WASTE OF WATER RUN OFF WHEN IT DOES WORK RIP OFF !! You may have low pressure in the water storage tank. You can use a tire gauge to measure the pressure (Wher25 should be about 5-7 bar or about 100 psi, check manual). If it is low, use a bicycle air pump to increase the pressure in the tank. There is a valve on the exterior of the tank near the bottom. Also, check the fittings for tightness at the top of the tank. You can take the drain line loose from the tap and create your own air gap by using a zip tie to tie the line to one of the sink brackets. Just make sure your drain line loops over a foot above where it ties into your drain. You will have to buy a quick connect from any hardware store that is 1/4 inch on one side and 3/8 inch on the other because you have to connect the 1/4" tube that was in the tap in one side and the 3/8" tube that goes into the drain into the other side. This should really quiet down your system. I had the same question and just got off the phone with customer support. The answer is no; a two hour flush is sufficient. The full 24 hours is only required for a new RO filter. (And doubtless when sanitizing the system with bleach). When I suggested that they amend the manual to reflect this the CSR said the Company felt it was just easier to have one set of instructions with respect to the flushing procedure. That doesn't make a whole lot of sense if you think about it but a two hour flush for basic carbon filters certainly does. I've noticed our spout at the sink is showing gunk building up and coming out now after a year. How do you clean the spout inside? Does this possibly mean the rest of the system is not clean throughout? I had a very similar system like this for 7 years and never had that gunk buildup in the spout. It puts out water pressure just fine and tastes great. Just noticed also that little spot doesn't come apart. Help! get them from a lowes because I also bought this unit and looked at amazon and liked to have a heart attack at the high prices they wanted. I can't get replacement filters that work. It seems that the original filters 14022 are not available and the filters supplied as the new replacements 14255 blew off under pressure. The old RO filter was 14003. The new filter might be 14248 or 14314. I can't find any online advice. I'm going shopping for a new system. Just purchased a new home and the WHERE25 was already installed. We keep hearing a drip sound and we have not been using this unit. We purchased new filters but have not installed because we began thinking this is causing our water bill to be much higher than normal. We are just wondering if anyone else thinks this drip drip sound we keep hearing is wasting water and if this system needs to be removed and I'll take the filters back and be done! Thanks. I never hear a dripping sound, but I do hear water flow just after I use it, which is normal. We only use it for drinking water, so all three cartridges have lasted more than three years before we had to replace them. With low or no use, the amount of water wasted is minimal. We were warned though that it could not be used off our City water supply, as it has too much calcium in it (relatively hard water), but we had been forced to install a water softener for the steam humidifier that the builder originally planned to use in the house, so have no problem with the unit because it is fed with softened water. Looking for a leak would be my second choice. First choice for checking out your problem (high water bills) is to turn off the supply valve feeding the WHER25, and open the unit's water faucet. Leave it that way (it should stop flowing in about 10 minutes) until you go through a complete water billing cycle, to see if there is any difference. Obviously, you could also just record your water meter every day if you have access to it. A dripping sound doesn't sound right if you are not using the water. If you were using the filtered water, then I'd say that the dripping was the waste water in your plumbing because when the tank is refilling you do hear the water--there's several gallons of waste for every gallon made. (It's the way reverse osmosis works and even then this is not a particularly efficient unit.) However, back to the point about using the water. If you don't use water, then the tank would not be refilling, and so it's possibly leaking somewhere. I would suggest looking for customer support on this product. I've had mine for at least 8 years running on hard water with only a few filter changes, and it still works, so it's basically a good unit and I'm sure whirlpool knows a ton about how it works at this point. However, are you sure it's the unit producing the dripping if you are not using it? A couple years ago some seal somewhere on mine loosened, and now I hear air escaping from the faucet when it fills. At first I thought it indicated the soon demise of my system, but it has just kept right on working, and the noise isn't very loud, so I live with it. If you want a water filter system this one is good but not very efficient and has expensive filters. Obviously, though it lasts a long time if you get a good one, and it's super easy to replace the filters. So, again, I don't think the dripping is ok if you aren't using the filtered water. If you read back through the comments here there's a ton of info, but I'd contact Whirlpool if it were me because that's probably easier than searching the comments. I found this, so will add to my reply. Here is a Whirlpool page for the unit and there is a link to a manual. A good 5-stage RO system allows all the filters to last much longer (12 months on prefilters), and the filtered water's quality is more guaranteed due to the many stages. So you'll save money and time in the long run with good quality 5-stage systems. What does it mean if a yellow light is blinking on the faucet apparatus? What does it mean I'd a yellow light is blinking on the faucet apparatus? Try ebay.com, I got a replacement faucet from them although not exactly the same. It worked but that still was not the problem and I am still trying to find solution. Has anyone tried replacing the pre-filter with the post-filter and putting a putting on a new-post filter. This might save a lot of money. They are the same filter and the post-filter always seems cleaner than the pre-filter when I replace them both. I've been thinking of cutting them open to see if this is true on the inside. I've done exactly that for about 2 years now and it saves a lot of money. It works fine. They are changing to different filters now that are specific to pre and post now - I'm stocking up on the older style. That is pretty smart. I think it would be worth a try. check where your waste water goes into the drain the 3/8 inch black hose should be unimpaired the saddle drain installation of piercing the pvc some times leaves a pigtail llike plastic behind this blocks the flow of water and can even lead to bacterial backup and food backup in the waste pipe this happened to me I redrilled the hole cleared the plastic and put in a new valve into the pvc pipe and it stopped backing up out of the drain. We have had some leaking from the system and I cannot figure where it is coming from. Take the red and black lines off the spigot and stick the red line into the black line tightly. No more air gap leaks. The air gap is only to protect sewage from flowing backwards into system. If your plumbing is installed correctly, this should never happen. Do not change filters until water recharge is slow and then only primary filter as it is the first one to plug. Check TDS to see if you need a membrane filter...9-15 TDS reading is good water 50-300+ is bad. Replace post filter only when water begins to taste bad. Saturday is the true biblical Sabbath. Jesus was a jew and never said he changed it. Keeping sunday is to become the mark of the beasts authority over people instead of the sign that YHVH gave the true Christians their connection to the Father. 4th commandment = seal of God's holy law. I have never tried this filter, but I have to say that im a bit hesitant. Cant this clog the drain of the faucet ?? I run a Water and Mold damage business in Dallas Texas. So ofcourse these things are very important for me. In response to the people who are having trouble with the gurgling when the tank refills. I just set this system up, and was really annoyed by the gurgling. My issue was that the black drain line was not sloped. If the water cannot flow freely out of the black line, it will pool up, and the red line drain water drops into it, creating the loud gurgling sound. I just shortened the black line, made sure it was as sloped as it could be, then zip tied it in place, and the gurgling is gone. Hope this helps someone, I feel better already. If you hear constant gurgling and the tank does not refill (get heavier), then it's a different issue. excellent article om the reverse osmosis system also check my article on reverse osmosis systems at my website. I bought whirlpool water filter, very good.